Package Pavement - Spec Mix Inc.
Home : About Us : Spec Mix Inc. The SPEC MIX® System of mortar and grout delivery has been an innovative force in the building industry. Since 1990, Spec Mix has focused on advancing the construction industry by providing a consistent and quality product. Contractors, engineers and architects around the world have realized the benefits of this proven system. Whether you are looking for a bulk order of custom grout, or an order of premixed spec mortar in 80lb bags, Package Pavement can deliver. Call us today to learn more about this innovative and cost effective system. 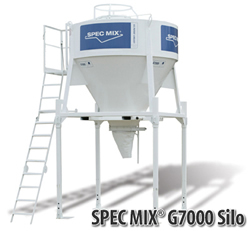 The SPEC MIX® system includes a large funnel-shaped silo and mortar, grout, or stucco manufactured to your specification. Just add water! Our factory pre-blended masonry mortar meets or exceeds ASTM, UBS, IBC, ACI or PCA standards. SPEC MIX® mortar satisfies critical plastic and hardened requirements, provides uniform consistency with every batch, and increases efficiency in the field. With a spectrum of colors to choose from, you’ll find exactly what you need to match, complement or contrast any brick, stone or block project. Because each color match is factory pre-blended, you’re guaranteed uniform pigmentation. No need to measure on the job! Like our regular mortar, SPEC MIX® colored mortar meets or exceeds industry standards. All you need to do is add water! SPEC MIX® Core Fill Grout is an essential component of reinforced masonry construction. Our factory pre-blended mix of cementitious material and aggregate meet the structural requirements specified for the project. Just add water, mix and you’re ready to work! SPEC MIX® Stone Veneer Mortars provide superior bond for precast lightweight masonry veneer units to base surfaces. The mixture formulations are specifically designed for optimal sheer and flexural strength, as well as exceptional workability properties to achieve good bond to the subsurface. The final wall system will produce a non-load-bearing, aesthetically pleasing exterior veneer or interior finish on concrete or masonry walls, stub walls or metal buildings. SPEC MIX® Shotcrete products are custom formulated for a variety of applications, including structural, soil nailing, restoration, pool construction and architectural finishing. Each product utilizes Portland cement, ACI graded aggregates and specialized admixtures including steel and plastic fibers for strength, cohesion and durability. Formulations are engineered for superior shooting and finishing properties for both wet and dry process applications. Each mixture is designed for reduced rebound and increased one pass buildup, so your team works clean and efficient. SPEC MIX® Stucco products are lab tested and /or field tested for superior workability and reduced sagging for faster installation, optimal compressive strength, flexural strength and reduced shrinkage for long-term durability. Each mix is a custom blend of cementitious materials, additives and aggregates, and fibers, when specified. Our stucco products can be used in traditional three-coat systems or two-coat systems and as a colored finish coat. Each batch is a pre-blended cement based product that meets ASTM C 926 standards. The SPEC MIX Bricklayer 500 national competition is happening at the World of Concrete in Las Vegas. It will be held at the Las Vegas Convention Center, Masonry Construction’s Challenge Arena in the Gold Lot. Visit www.specmixbricklayer500.com for more details.